From time to time the world of racing gives birth to some mouth-watering road legal cars for the enthusiasts to dream about. Twenty years ago there was the Porsche 911 GT1, forty - the Ford RS 200 and six decades have flown by since the introduction of the Mercedes 300SL Gullwing in 1954. Which was record braking not only in terms of speed but also with its $11,000 price tag. 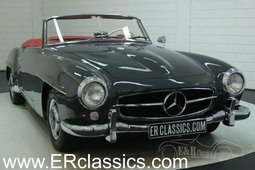 The Gullwing is often said to overshadow it's simpler descendant the Mercedes-Benz 190SL. That is somewhat true but the 300 is also the one that attracted attention for the 190 in the first place. Two men share most of the responsibility for making these cars available to the 'masses'. First one is Rudolf Uhlenhaut - Mercedes race car engineer who made sure the cars were mechanical legends. And the one who sold the idea for a road legal Gullwing to Mercedes was Mr. Maximilian Edwin Hoffman. A genius businessman who was introducing European cars to the American market. Hoffman suggested using the SL 's racing success as a marketing tool. 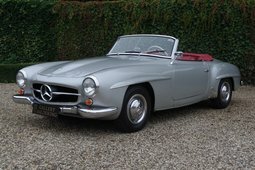 He pushed the idea even further and came up with a more down-to-earth version of the race car - the 190sl. 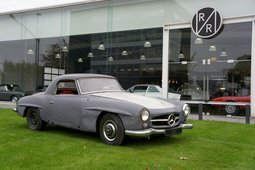 Mercedes took the gamble and not long after two magnificent cars appeared in the 1954 New York International Motor Sports Show. 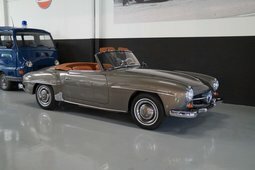 A road version of the 300SL Gullwing and a prototype of the 190SL - two different cars. The first one - a sophisticated, innovative all enthusiast machine. And the second - a superb cruiser with the possibilities of occasional racing line crafting satisfaction. The foundations for the Mercedes SL line philosophy were set, but it was not absolutely clear what they were. 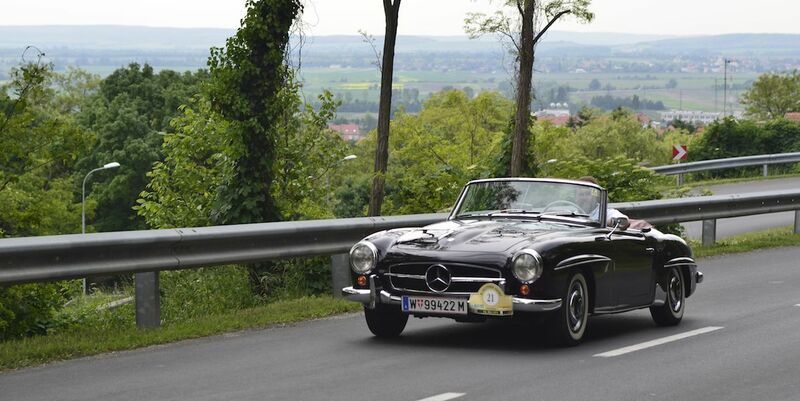 Although the "S" stands for "sport" it's not entirely true with the 190SL. Partly because the 4cylinder m121 engine developed 104hp which is more "safe" than "sport". And partly because the "L" standing for "Leicht" (lightweight) is also a little ambitious. Even with the aluminum hood, doors, trunk and dash it weighed 1160kgs. Not too bad but rather heavy for the smaller carbureted engine. For comparison it's over 2 seconds slower to reach 60mph than the 1953 Austin Healey 100. 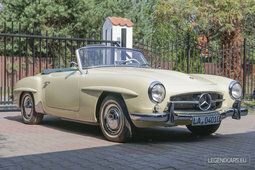 In the brochures which Mr. Hoffman was distributing at the auto show it said that the 190SL is a sporting car with less of the racing car drawbacks. And that is exactly what it is. A brilliantly engineered and beautifully sculpted two-seater for the pleasure of driving. Attention to detail is everywhere. It just oozes Mercedes quality. From the special luggage set in the trunk to the instrument cluster. So much eye candy - it can actually raise your sugar levels. There were two options for this hyperglycemia causing machine to choose from - a soft top and a detachable hard top roadster. One of the brochures even advertised the hard top as a track day car. It offered lightweight racing doors with an arm cut-away, smaller plexiglass windshield and suggested taking off the front and rear bumpers for even more amazing lightness. Even if it didn't help to win races it looked great while participating. 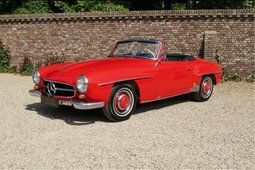 In 1963 a replacement for the 190SL was launched - the SL Pagode. 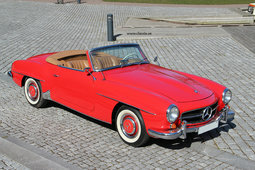 This meant that the 9year production of the first SL model came to a stop. Out of the 25881 190SLs built, around half have survived and therefore can provide a very good deal in terms of smiles per euro.